Recipe: Eggs Jeanette From the Kitchen Window column. Pepin often talks about this childhood dish served by his mother, Jeanette. It is easy, economical and makes a wonderful first course or light supper with a salad and fresh baked bread. The recipe is adapted from The Essential Pepin, by Jacques Pepin (Houghton Mifflin Harcourt 2011). 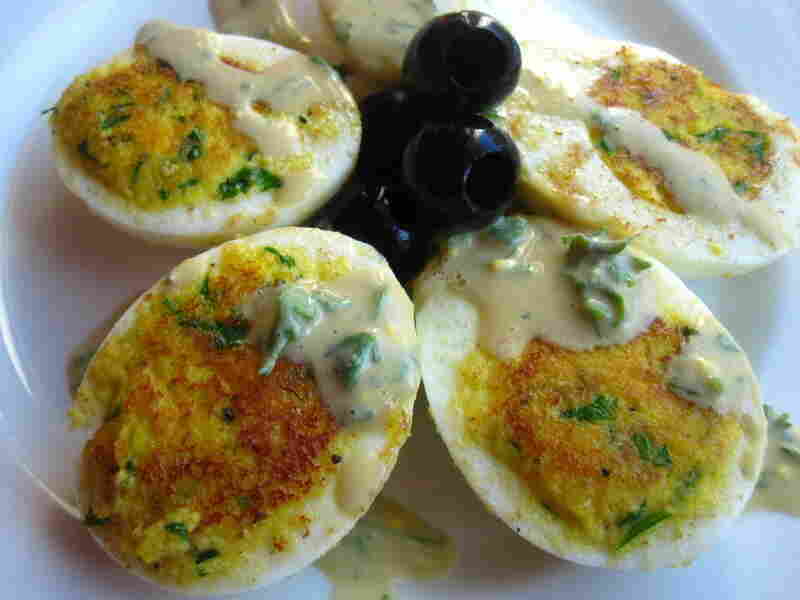 Cut the eggs in half as you would for deviled eggs. Remove the yolks and push them through a fine strainer or mash them with a fork. Mix the egg yolks with the milk, garlic, parsley, salt and pepper. The mixture should be moist and hold together. Stuff the whites with the yolk mixture, reserving approximately 2 tablespoons for the dressing (the egg yolk mixture adds texture to the dressing). Heat the oil in a large skillet, preferably nonstick. When the oil is hot, add the egg halves, stuffed side down, and fry over medium heat for 2 minutes until browned. Remove the eggs from the skillet and arrange on a platter. Put all the ingredients except the oil in a food processor. With the motor running, slowly add the oil. Pour the dressing on top of and around the eggs and serve.